I recently attended a product training class on high volume low speed fans, and a statistic was thrown out to the audience that really got me thinking. A NASA study, Compendium of Human Responses to the Aerospace Environment*, showed that worker productivity falls significantly for every degree over an optimum temperature of about 72 degrees. If the temperature hits 85 degrees in the workplace, productivity drops by 18% and accuracy a walloping 40%. 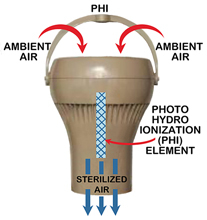 Heating and cooling equipment is paramount in this issue. Beyond that, consider temperature stratification – the tendency for heat to rise and cold air to fall, leading to uneven heating or cooling in a work space. In a large facility like a warehouse or factory with high ceilings, temperature variations can be widely spread. 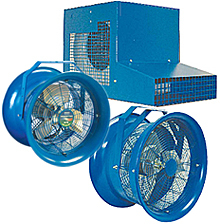 Fans, either high velocity, narrow coverage fans or the large high-volume low speed fans keep air moving for greater worker comfort. Ergonomics has been a huge issue in workplace injury prevention for several years now. Reducing stress on the musculoskeletal system is imperative for worker health and injury prevention. Reducing repetitive movement is also important, for those motions often lead to long-term health issues like carpal tunnel pain, osteoarthritis, tendinitis and other motion related issues. 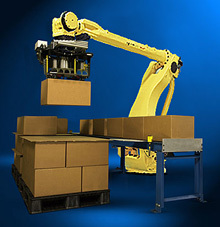 Providing lift assist equipment like hoists and air balancers, appropriate work height at work stations, pallet positioners, lift tables and scissor lifts, chairs and stools to reduce time standing in one place, and using robotics for repetitive motion activities greatly reduce worker injury and increase productivity. Reducing machinery noise, exposure to loud equipment and utilizing noise suppressants like acoustic curtains, ear protectors and quiet conveyors, like Hytrol e24 and fans go a long way toward protecting against hearing loss. They also reduce the emotional stress workers feel in the workplace. We often forget how noise ratchets up anxiety and a sense of stress. Those factors alone can impede productivity as the body expends energy on blocking and managing those elements. When lighting is insufficient, workers expend more time locating, assembling and handling objects. This is because visual confidence has been impaired. The worker must spend more time identifying and assuring they are correct in their actions. When lighting is bright and effectively placed, workers can move more quickly because they have visual confirmation that their judgements are correct. Air quality can be addressed in so many ways – from dust and debris to toxins and gasses, even to how it smells. When air quality is not well managed there is the risk of widespread illness, lung problems from inhaled dust and debris, even stomach upsets from odors present in the workplace. Productivity is affected in many ways from air issues – increased sick days, greater long term illness, and lower worker morale can drive productivity lower without you even knowing the causes. When workers perceive their safety is at risk, productivity drops. The greater the perceived risk, the more effort the worker expends assuring his/her safety which results in getting less done. Accuracy also drops as workers are distracted from their primary activity to accident prevention. The more you can reduce safety risks with equipment like guard rails, machine guards, and safety training, the more confident your workers will feel at their jobs. They will understand the real risks and have proven safety measures to follow. Reduce the risk and productivity improves. 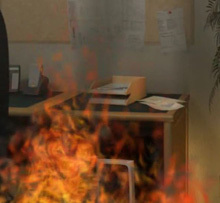 Fire risk reduces productivity by creating situations where accidents and injury can happen. Fire also puts your entire operation at risk, so be wise about fire safety. Assess, evaluate and implement appropriate fire reduction measures. Then train employees in safe chemical, oil and other flammables handling and storage. Clearly mark flammable storage areas and enforce safe practices. When you do these things, productivity rises because there is order and risk is reduced. Employers in the industrial age used to think that workers should accept whatever conditions were present and be happy they had a job. Time and experience have shown us conclusively that making workers comfortable in the workplace doesn’t make them lazy, it makes them more able and willing to put their full energies into their jobs. When the mind and body is not stressed by outward factors, they can be focused on the task at hand with confidence, speed, and accuracy. I’d say the cost is not a loss, but rather, an investment that goes directly to the bottom line.